Johann Stallbaum (1793-1861) published Eustathii Commentarii ad Homeri Iliadem in four volumes between 1827 and 1830. 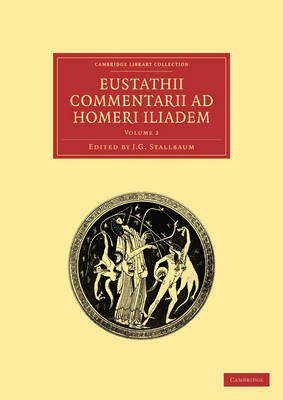 It contains the Greek text of Eustathius of Thessalonica's twelfth-century commentary on Homer's Iliad. Volume 2 (1828) contains books 5-10 of the commentary. The work is primarily a collection of extracts from much earlier authors. Eustathius' position as archbishop of Thessalonica and professor of rhetoric in Constantinople gave him access to libraries rich in ancient texts, many no longer extant. His commentary is one of the best sources of ancient Homeric scholia and preserves many otherwise lost extracts from writers such as Aristarchus of Samothrace, Zenodotus of Ephesus, and Aristophanes of Byzantium. Stallbaum's edition is a revised and corrected version of the Editio Romana of Majoranus (1542-1550). It has been an essential tool for generations of classical and Byzantine scholars. It is a great achievement of nineteenth-century scholarship.